Acting responsibly towards the environment. Optimize and control our industrial waste. Optimize our energy consumption and natural resources. Contributing to the reduction of the ecological effect we have created as a design result. Ensure compliance with environmental regulations. Trèves Group is committed to being part of a sustainable development process with concrete steps using the products, services and activities of the automotive industry. These activities focus on reducing ecological impacts, respecting ecological / environmentalist designs, waste reduction and energy consumption environments. The group has expressed its desire to control the ecological effect since 2004. Top Management wishes to continue and actively pursue its actions while respecting the Code of Ethics and respect for the Global Compact as well as respecting the principles. 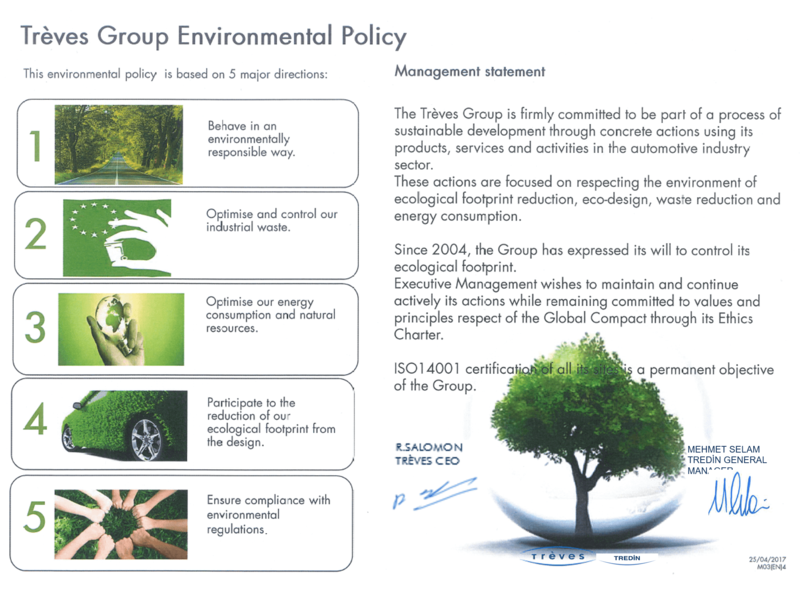 ISO 14001 certification is a permanent / permanent goal of the group. 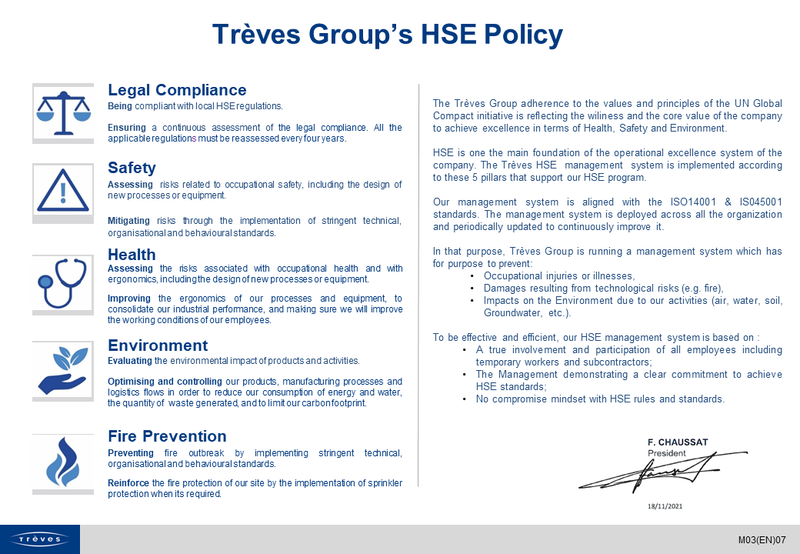 Trèves General Management defined the group quality policy with 5 main items related to «Single Trèves». To fulfill group commitments to meet customer quality, cost and delivery requirements. To align our industrial and purchasing performance with the highest quality criteria. Respond to innovations that are technically and industrially valid. To control all processes, prioritize prevention and risk analysis. To ensure the commitment of resources and to constantly adapt their capabilities. Quality management and customer satisfaction are among the group's strategic commitments. Our quality policy is based on continuous search for excellence to offer the highest market standards to our customers in terms of products and services. Our priority is to select innovative product designs and reliable industrial processes to enhance compliance with regulatory, regulatory, regulatory and safety requirements in order to enhance compliance with innovative product designs and reliable industrial requirements. Grubun's organization is based on leadership, empowerment of our employees, increased productivity and support for effective decision-making. The Trèves Institute provides continuous improvement of the competences of our employees. Our quality is defined by our process approach based on ISO TS / IATF 16949 reference system, SWOT risk analysis and ongoing improvement approach with TRÈVES Exellence System (SPRINT). The purpose of this declaration is to confirm the commitment of the management to the quality approach and to define the organization responsible for enforcing and measuring its effectiveness and efficiency. 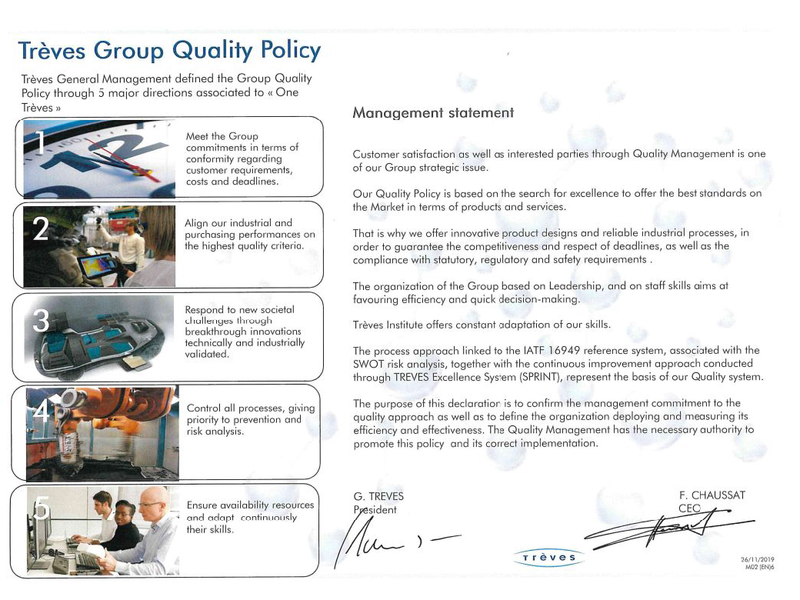 Quality Management is empowered to ensure implementation and enforcement of this policy.